TAYA GRAHAM: It’s a fusion of capitalist propaganda and postmodern hubris. I’m talking about a controversial Super Bowl ad that superimposed the words of Dr. Martin Luther King Jr. over a series of images construed to sell a Dodge Ram pickup truck. MARTIN LUTHER KING JR.: If you want to be in power, wonderful. If you want to be recognized, wonderful. If you want to be great, wonderful. TAYA GRAHAM: The ad has provoked outrage. Partly because it appropriates the legacies of King’s iconic rhetoric to sell a product, but also because it’s an audacious exploitation of Dr. King’s legacy to promote capitalism and consumption, two American compulsions he railed against as partly responsible for the ills of American society. Perhaps this ad reveals just how much Dr. King’s most radical philosophy has been scrubbed from history and how far the myth of his life has been divorced from his beliefs. It’s a fallacious revisionism made even more pointed by the fact that the ad was released just a few months shy of the 50th anniversary of the day Dr. King was gunned down outside his room at a Memphis hotel. That murder by a gunman named James Earl Ray, like his legacy, still resonates today. To help me clarify the substance of Dr. King’s philosophy on the anniversary of this tragic event and how it applies to many of the most vexing issues we face today is a scholar who understands the subject matter intimately, Dr. Gerald Horne. Dr. Horne holds the John Jay and Rebecca Moores chair of history and African-American studies at the University of Houston. His research has addressed issues of racism in a variety of relations, including labor, politics, and civil rights. Dr. Horne, before we talk about the assassination, I have to ask you about this ad. I reread the sermon that its excerpted from, which is known as the “Drum Major” speech. It’s really a speech about humility and to a certain extent the destructiveness of consumer culture. In fact, in the speech Dr. King talks about buying a car that you can’t afford as a sign of spiritual distress. Now, last time I checked, a Dodge Ram costs in excess of $50,000. Is this tone-deaf? Is this another symptom of his image being sanitized for White America? GERALD HORNE: I do think it’s another example of his image being sanitized. However, we should not be shocked nor surprised. Keep in mind that just before Martin Luther King was assassinated in April 1968, his popularity was not necessarily sky high. At least, outside of the non-black community. This reveals another disturbing aspect of this entire tawdry episode. That is to say it’s become commonplace nowadays for men like Dr. King to be excoriated by the corporate media (and others who believe in the corporate media) while they’re alive and then after they’re safely tucked away in their coffin in a grave, then their images are refashioned to somehow either support corporate capitalism or undermine those who are opposed to corporate capitalism. This is what’s going on today. Then of course we should ask the unavoidable question, which is how did the estate of Martin Luther King come to authorize this ad? Keep in mind, that the estate of Dr. King holds his image dear. It’s very difficult, often times, for scholars to quote his words and yet we see this corporation on Super Bowl Sunday use one of his most powerful speeches to sell a pickup truck. This is beyond comprehension. TAYA GRAHAM: It’s interesting because Dr. King delved deeply into income inequality and the destructiveness of poverty. He even said this country has socialism for the rich and rugged individualism for the poor. What do you think he meant by that? How did his thinking on poverty evolve? GERALD HORNE: Well, anyone who has been paying attention to what’s going on in this economy for the last decade or so knows precisely what he’s talking about. Keep in mind that when the banks and Wall Street tanked about a decade ago their losses were socialized. That is to say we had to pay for them, the working class people, the poor people, et cetera. When they get profits those are privatized. That is to say they go to the 1%. With regard to the rest of us, the opposite basically obtains. As we speak, you know I’m sure that in December 2017 Congress passed another so-called tax reform bill, which is shoveling many more billions of dollars to the wealthy and yet Speaker Paul Ryan of the House of Representatives has already suggested that there will be a necessity to cut social programs, that is to say healthcare and education, because the government does not have enough money, he says, precisely because of this tax cut. Dr. King, if he were alive, would understand what’s going on perfectly. 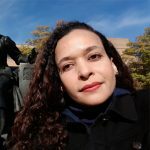 TAYA GRAHAM: It seems that Dr. King thought not only did he need to combat poverty for the moral reasons but because he saw it as a critical threat to democracy. How do you view his concerns in light of our historic income inequality and the rise of political figures like the Koch brothers? How do you think Dr. King would have reacted to these events? GERALD HORNE: Well, it’s obvious that this is a contradiction to the concept of democracy. That is to say that we have in this country, I’m afraid, at least in certain circles, a very narrow conception of what democracy means. It basically means trooping to the ballot box on the first Tuesday in November and casting a ballot for one candidate or another who is supported by the corporate media and their backers. We’re not talking about democracy in the workplace, for example. We’re not talking about the democracy in terms of the sharing of the wealth that corporations like General Motors and Microsoft and Apple are generating. We need to reform and refashion — and radicalize, indeed — our very primitive conceptions of democracy. I’m sure that if he were alive today Dr. King would be in the forefront of those who are espousing that particular doctrine. TAYA GRAHAM: Professor, let’s move onto one of his last speeches at the Riverside Church in New York. He took on the topic of the Vietnam War and he called the United States the greatest purveyor of violence in the world. Does his characterization hold true today? GERALD HORNE: Well, it not only holds true today but it holds true historically. Keep in mind that although some have forgotten, the United States of America is an exemplar of settler colonialism. That is to say hundreds of years ago you had European invaders who ousted the Native Americans from the land and then went to Africa and kidnapped those like my ancestors and brought them back here to work for free. Then after the Native Americans were swept from the Atlantic to the Pacific and ousted the United States then went abroad to places like Hawaii and Puerto Rico to basically install a similar kind of system. Today, as we speak, you see U.S. imperialism involved in a 16, 17-year war in Afghanistan that is called the “Forever War.” You see that in the last decade or so the United States invaded Iraq, toppled Saddam Hussein, and then presided over his execution. You see that in the last decade or so the United States went into Libya after Libya had relinquished its so-called weapons of mass destruction, that is to say nuclear weaponry, and presided over the ousting of Colonel Gaddafi, the leader, and then stood by idly as he was murdered. Now we see the United States issuing threats, very dangerous threats, against the regime in North Korea. Yes, the United States remains the major purveyor of violence in the world today as it was 50 years or so ago when Dr. King made those prophetic words. TAYA GRAHAM: Now after Dr. King had his successes with civil rights why did he shift to the war? GERALD HORNE: Well, I think he realized what many of us realize today. That it was fatuous to talk about solving problems of education and healthcare when a disproportionate share of our tax dollars are going to the Pentagon to fight wars. Wars in Indochina when he was alive, and wars in Afghanistan and Iraq and increasingly, I’m afraid, North Korea in 2018. TAYA GRAHAM: Now one thing that struck me about that speech is the connection he makes between poverty and war. In other words, that the Vietnam War diverted momentum and resources from the civil rights movement. Can you talk about this dynamic in light of our current militarism? Did he believe, in a sense, that war was a pretext for ignoring poverty? GERALD HORNE: Well, certainly. I don’t think that you could take seriously the ideas of President Lyndon Baines Johnson in the so-called Great Society and the so-called War on Poverty because he was at the same time fighting this war in Vietnam and indeed in all of Indochina. Likewise, during that particular period you may recall that the United States was one of the major supporters of apartheid South Africa. How could you credibly talk about fighting a war on poverty when you’re basically perpetuating poverty in southern Africa? It was a contradiction very difficult for Dr. King to swallow. TAYA GRAHAM: Well, referring back to the “Drum Major” speech. Dr. King seems to work from the perspective of humility and being cognizant of our impulse for attention. Is there any lesson in that for today’s activists? What do you think Dr. King would think about Twitter and some of the grandstanding that accompanies activism? GERALD HORNE: Well, certainly this country could take and accept very easily a dose of humility, but with respect I think that humility should begin at the top. It should begin with those who are wielding the power against the rest of us. Although, certainly, your point is well-taken with regard to activists and some of the needless Twitter storms and Twitter wars that erupt almost effortlessly. I think that our movement would benefit with less of that. TAYA GRAHAM: We already talked about his views on poverty. How did he view the intersection of race and poverty? For example, in Baltimore much of the worst concentrations of poverty are in African-American neighborhoods. What did he think about the reality of how racially oriented poverty is in this country? GERALD HORNE: Well, I think that it was an evitable result, he would say, of the fact that the population of African descent was mostly enslaved. Then after the abolition of slavery circa 1865 there were not concerted programs to help to uplift this population from the ravages of slavery. Instead you had the rise of the Klu Klux Klan and terrorist organizations that successfully deprived this black population of the right to vote. You had the cascading of racism, which hampered the ability of black Americans to get work or to live in certain neighborhoods or even earn a decent living, and what you see in Baltimore today is the inevitable result of what I’ve just described. That is to say that even today there has not been and there is not a concerted effort to address the ravages of slavery and of Jim Crow, not to mention contemporary racism. TAYA GRAHAM: As we’re thinking about his assassination, what lesson from Dr. King would be most relevant in the Trump era? What would he say about President Trump? More important, how would he counsel us to deal with a country that seems to be veering towards intolerance and division under Trump’s leadership? GERALD HORNE: Well, I think that one of the reasons why Dr. King was killed was because he sought to internationalize the struggle against domestic racism. I think that’s the clear implication of his coming out four-square against the war in Indochina. It’s very dangerous for organizations and leaders to seek assistance abroad against antagonism and enemies at home. Certainly, I think that that’s one of the lessons that we have to ingest and imbibe today in 2018. That is to say that we’re facing a formidable foe in the 63-million-strong voting block that propelled Donald J. Trump into the White House. Historically, we have been able to overcome slavery, then Jim Crow, precisely because we internationalized that struggle. Unless and until we do the same today I’m afraid to say that we will be continuing to face a formidable antagonist in the White House and one Donald J. Trump. TAYA GRAHAM: There’s one question I’d like to ask about some of the current events regarding the controversy over the FBI surveillance of Trump. Now of course the present conflict is over foreign surveillance. As we all know, the FBI surveyed Dr. King extensively. Have Republicans ever criticized this lawless misuse of surveillance? GERALD HORNE: Well, I think your question answers itself. Obviously this is the height of hypocrisy that the Republicans are raising these searching questions about the FBI today in 2018 when they did not have a mumbling word to say about the surveillance of Dr. King or alternatively you could say they were cheerleading and giving high fives to the FBI when the FBI was putting bugs in Dr. King’s hotel rooms and tapping his telephones and harassing him. I think that there are still questions to be answered indeed about the tragic murder of Dr. King on April 4th, 1968. 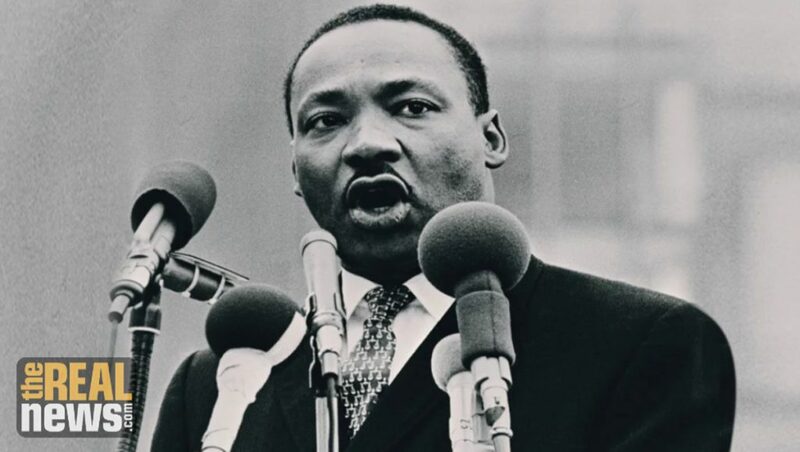 That is to say that the late leader of the Congressional Black Caucus, Congressman Louis Stokes of Cleveland, did an investigation while he was in Congress that suggested that there was a high-level conspiracy to kill Dr. King. This was the conclusion of a body of Congress, not of a novelist, not of a screenplay writer. Indeed, I think that the Stokes Report needs to be reexamined as we approach the anniversary of Dr. King’s murder. TAYA GRAHAM: Is there anything that racial justice activists today should take from Dr. King’s legacy moving forward? GERALD HORNE: Well, there are a number of things. One, I would say the attempt to internationalize the struggle, the Black Lives Matter movement and the movement for black lives have made steps in that direction by forcing investigators from the Human Rights Commission of the United Nations in terms of their inspection of poverty and deprivation of basic rights in the United States of America. More needs to be done. I think that there needs to be closer coordination with progressive trade unions. I think for example the Hospital Workers Union, which is headquartered in New York City, which Dr. King considered to be his favorite union, which he worked with hand and glove. I think that those are the two basic lessons that Dr. King’s life imparts to today’s activists. TAYA GRAHAM: I would like to thank my guest Professor Horne for this important conversation about Dr. King’s legacy and my producer Stephen Janis for his research. I would like to thank you for joining me at The Real News.